Can be used with 2 additional DEK Universal Generator Extension Cords for a total reach of up to 75 ft.
Connect two eZV-series inverter generators with this single cable. Two twist-locking ports securely connect to each generator in a single connection, no fussing with ground wires or multiple connections. 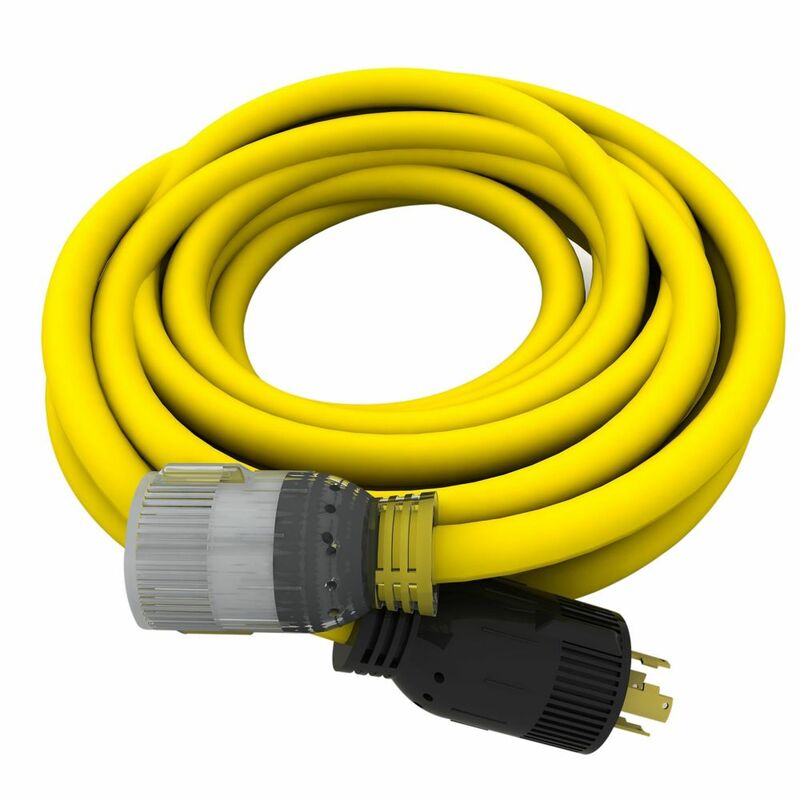 This cable will combine the total output of the two connected generators into a single output, ideal for powering larger RVs, trailers, or emergency backup at home. Designed for use with manual transfer switches and power inlet boxes, Generacs heavy duty, all rubber power cords connect your generator to the power inlet box and/or transfer switch. The locking plug and connector match up with the power inlet on each transfer switch and power inlet box. Most portable generators are supplied with a locking receptacle that accepts the locking plug on one end of the power cord. Universal 25 ft. 10/4, 240V Generator Extension Cord Give your generator extra reach with the DEK Universal 25 ft. 10/4, 240 Volt Generator Extension Cord. This commercial-duty cord is compatible with L14-30 outlets. Recommended to reduce harmful voltage drops versus standard 120 Volt extension cords. Universal 25 ft. 10/4, 240V Generator Extension Cord is rated 4.9 out of 5 by 39. Rated 5 out of 5 by Speags from Well made cord and very pliable. Would recommend it to anyone. Well made cord and very pliable. Would recommend it to anyone. Rated 5 out of 5 by Jeaneve from Just as described Item came quickly and as describe....Wonderful now I can power up my whole house! Rated 5 out of 5 by Mary from The cord was exactly what I wanted.... The cord was exactly what I wanted. Rated 5 out of 5 by Sam from Excellent product. Shipped and delivered more quickly than stated. ... Excellent product. Shipped and delivered more quickly than stated. Rated 4 out of 5 by Robie from Looks good .Have not used yet.... Looks good .Have not used yet. Rated 5 out of 5 by EZ from High quality. Especially appreciated the weather-proof male and female plug... High quality. Especially appreciated the weather-proof male and female plug ends. If I had made up the cord it would have been more succeptible to rain intrusion.